Live, Love, Laugh and RENOVATE! 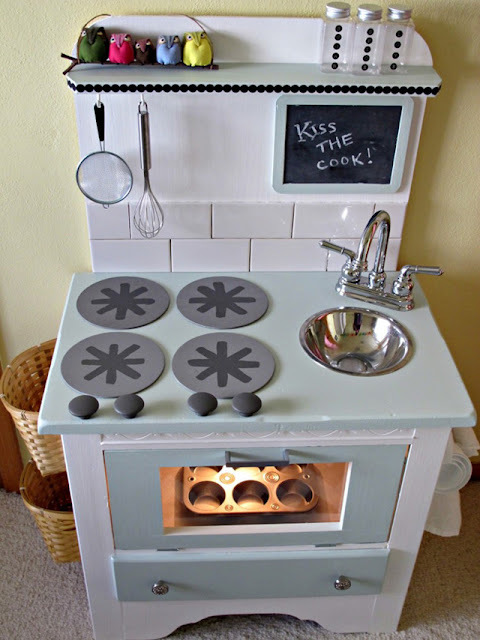 : DIY Play Kitchen Plans! This week something VERY exciting happened!!! 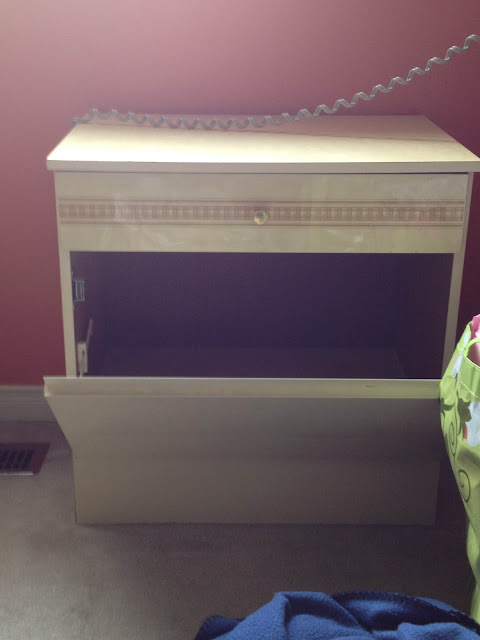 A friend asked me if I would convert an old nightstand she had into a play kitchen for her daughter. I didn't even have to think twice about it! I just jumped at the opportunity! Ryan and I have such awesome plans for this lovely nightstand!! Its honestly the perfect nightstand turned kitchen! It already has a drop open door for the oven!! SO now here is the plan. After perusing Pinterest and other websites online I think my favourite play kitchen is this one from Dwell Lovely. I just love how cute it is!!! The night stand is partially laminate... a high gloss laminate at that. SO instead of fighting to sand/paint the laminate sections (mainly the fronts of the doors) and risk ruining the whole thing. So here is the to do list to make it into the play kitchen. * Install oven knobs - I picked up some awesome bright knobs at a warehouse sale that will work PERFECTLY! * Lights - If it will work I want to put a push light inside the oven and push lights under the shelf. I may nix this one but I think it would look awesome!! * Oven rack - I have an awesome idea for making an oven rack for inside the oven using dowelling. Hopefully it works out!! Whew I'm tired just writing all of that!! Now I have a timeline... this baby has to be done by June 13th!!! So I'd better stop typing and get on it!!! Wish me luck! I'll be back periodically to let you know how my progress is going!